From your account its true teachers those days were more than life itself. They earn respect rather than demand. Money to them is not everything. Not that they are well off but rather they knew which student came from a poor background and in whatever small way they could help they sincerely & willingly did it. How we missed them. 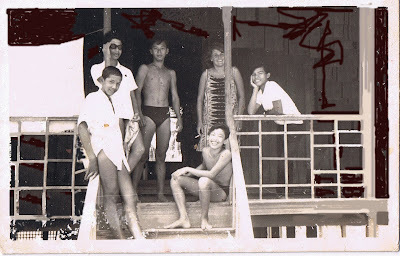 Here is an old photograph of Miss Decker together with yours truly (extreme right) and few friends taken in 1966 at her house by the Batu Burok beach. She shared the house with another teacher by the name of Miss Carol who taught us English Literature. They're not just teachers but they are also friend. I'd been keeping this for the last 42 years. A Closeup of her...aint she pretty? The message she wrote at the back of the photograph she gave me. Every weekend we would cycled to her house. And the house would be turn into a 'club' of sorts. We would gather and each and everyone of us would have a field day; swimming, playing guitar, reading books from her small library. Some would even have a joyride on her 50cc honda cub..she won't mind. One day a friend of our was caught for riding without a licence. She was very upset not because of riding without a licence but of being caught. After numerous attempts I finally come to SANGSURA. So this is where you are.Your sentiment on a long lost teacher , for some personal reasons, pleases me.We all have memories of those teachers who played their roles in our life.You are fortunate to have pictures of those days. I do not have. I cannot recall any one with a camera during my days! I am envious, for the reason that I can barely feel such attention and friendship from the person you call teacher. Yes, I do have such experience of befriending teacher, and I think we can interact more comfortably that way. But I am not blaming anything on teachers for not building such relationship with student. The thing is that, student, particularly teenagers nowadays are rebellious, and they are more comfortable with friends of their own age. That might be quite a bias view from me because that is how I see this thing works. Anyway, Miss Grace Decker left you a significant impression, and it lived for 40 years already. That's how a kindness of another effect another soul. That Grace Decker was a gem of a teacher. I believe they don't make teachers like that anymore these days.. and those two ladies were so pretty! En Hassan - Thank you for the visit.I should have left you the url to my blog..at least it save you the time. Hope to see you soon for coffee perhaps. Akmal- Thank you and it nice to know that you experienced the same with your teacher.Those teachers back then, they're so sincere in their undertaking and seemingly wanting no fanfare.That's the very reason we missed them I guessed. Puteri- Thank you for visiting. I'm truly honoured.I've been your true fan the very first day you blog from the old abode to this day...Yes both of them were not just pretty but kind too.But then we don't take chances. So long I've not been to your abode. 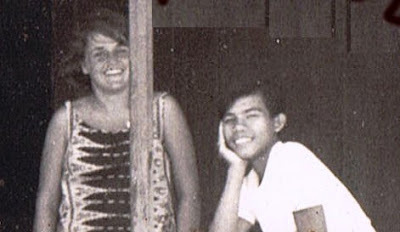 When I was in Sultan Ismail College in KB in the late 1970s, our Physics teacher is from the American Peace Corps. He lived in one of the kampung houses near the college by himself, and welcome students to visit him during weekend for extra Physics lesson. On a few ocassions I saw Malay girls there, discussing, um and er, velocity and such like. I remember clearly the way he congratulated me for scoring a distinction in Physics in the MCE. I taught a number of Peace Corp people when I was in Language Institute and I met a few when I was teaching in Kuala Brang. Almost all of them are nice. I guess the selection process made sure of that.